Stetson was Tom Mix's trademark. 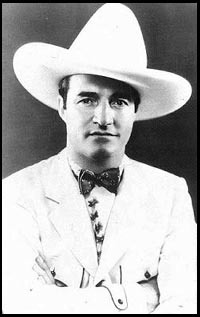 Tom Mix was born on January 6, 1880 in Mix Run, Pennsylvania. His parents Edwin and Elizabeth Mix named him Thomas Hezikiah Mix. When he enlisted in the Army in April 1898, he listed his name as Thomas E. Mix. Tom Mix was the top cowboy of American silent films, known for his daring stunts.As years passed he became equally famous for his elaborate cowboy outfits; he's the model for the dandyish, squeaky-clean movie cowboy that was much parodied in later years. Mix was a cowboy movie star; a big one. He appeared in over 300 Westerns. He lived the life of a bon-vivant; by the early 1920s this former Texas Ranger was earning the princely sum of $10,000 a week. Mix also had a famous steed, Tony the Wonder Horse. Mix's movie career ended when silent films were replaced by talkies, but later the Tom Mix radio program ran for nearly 20 years, with various actors providing the voice of "Tom Mix." He ended up working in rodeos and circuses, then died in 1940 in a weird automobile accident, his head crushed by a suitcase that flew off the rear shelf of his single-seated roadster in the middle of the desert.